Competition Garment Bags by Danshuz. 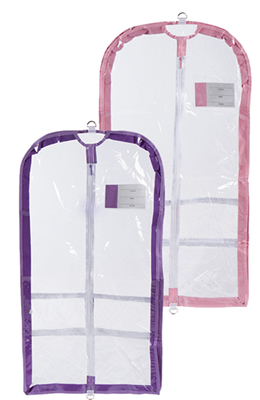 Sturdy pliable PVC garment bag trimmed in your choice of pink or lavender. Three inch expandable gusset accommodates bulky costumes or multiple small hanging garments. Three outer zipper pockets (one large, two small) for shoes or accessory items.